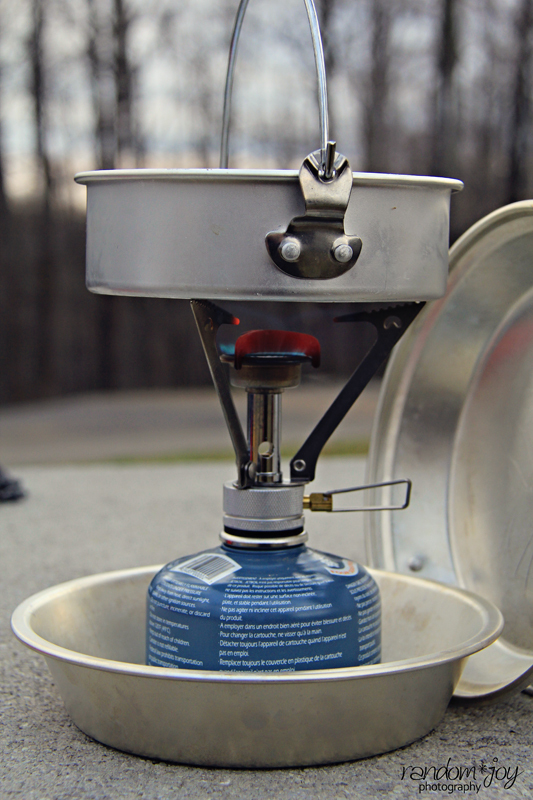 In backcountry camping, it seems a canister stove is the new black. They are compact, reliable, lightweight, and easy to use. 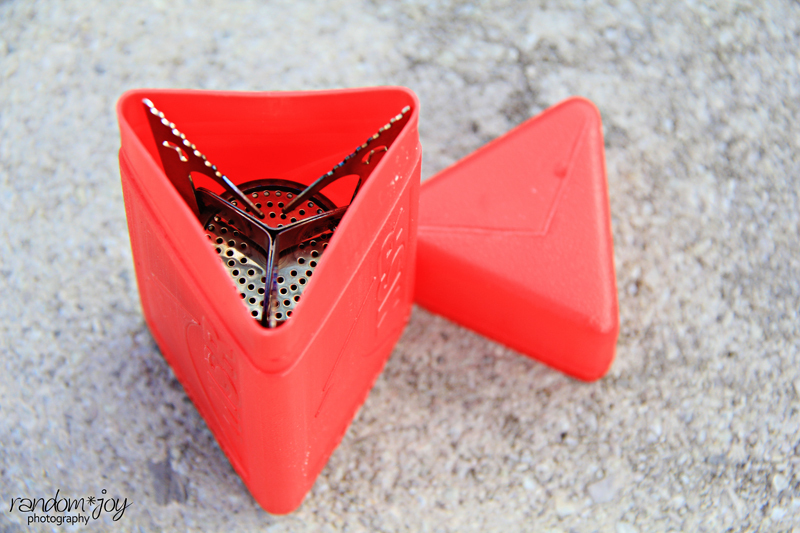 Our little backcountry canister stove of choice was the MSR PocketRocket . It's tiny, weighs in at only 3 ounces (4.2 when it's in the container), and is incredibly efficient for its compact, fit-in-palm size. The unit itself looks like some kind of medieval torture device. When you take it out of the canister, you screw it onto a fuel canister, open the serrated pot supports, turn the fuel adjuster and light it with a match or lighter. The maximum diameter for a pot according to the owner's manual (what can I say, I'm a girl - I read these things!) is 8 inches. After cooking, turn the stove off and let it cool before attempting to remove it from the canister. Then fold up, and store away. Simple enough, right? MSR doesn't list BTU ratings on their website, but they do claim that this little guy will boil 1 liter of water in under 3.5 minutes. If my math is right and assuming 70° water, that would mean that 1 L of water at 70 degrees Fahrenheit being raised to boiling (212°F) would require approximately 5,287 BTUs (assuming 100% efficiency which we know is not going to be the case). So, if we also assumed 30% efficiency, we'd need to nearly double the time to 7 minutes or boost the output closer to 10,000 BTUs in order to bring 1L of water to a boil within the time MSR claims. I have seen where other PocketRocket owners have suggested a BTU rating of up to 11,000. Personally, I thought that was probably a little optimistic, so we put it to the test. Tim took the stove out on the deck this evening. It was 37°F without any wind, which sounds like a pretty good night to assume 30% efficiency. He lit the stove and placed 1L of 70°F water on to boil. It took 6 minutes and 45 seconds to reach 212°F. So, I don't know what variables MSR used to calculate their specs, but even after a few tries, we were never able to reach boiling in under 3.5 minutes. That would mean, in essence, that the stove was only putting out approximately 5,000 BTUs (assuming 30% efficiency) and that I was correct in assuming we'd have to nearly double the time. Fuel, of course, does make a difference, and we were using Jetboil fuel in the 100gram size canister. It claims the isobutane/propane mixture will boil 10 L. We didn't test this claim, but after the initial boil test, I'm not sure this is likely. I'd like to try that out soon, and maybe a different brand of fuel just to make sure. I don't see much difference between the Jetboil fuel and the MSR fuel. Both types have the isobutane additive, which helps maintain fuel pressure as the fuel level gets low. But it also seems like boil time increases as the fuel level gets low. It might be best to move from a 100g canister to a larger 230g canister. Regardless, we really like our little stove. It works well, but is less efficient when there's wind. MSR sells a WindScreen on their website "for any MSR stove," but also says in their manual not to use one. So, go figure? We wouldn't mind having something to block the wind. We've had this stove for over 2 years now, but haven't used it enough to talk durability. So far, it's passed the test of time, but only more time will tell how durable it really is. 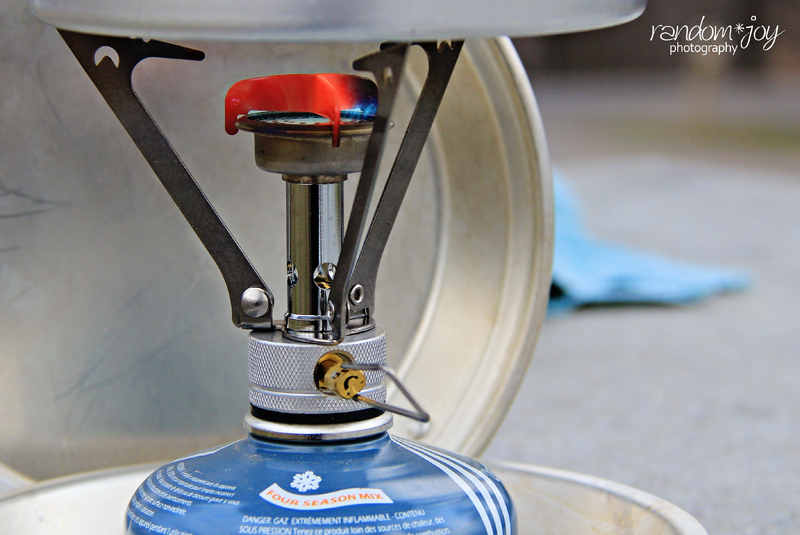 As with any type of stove, you should never operate it in an enclosed environment like a tent (carbon monoxide fumes), and you should always be careful to store your food away from your fuel. We don't have a fuel canister container, so we store ours in a zipper bag usually at the very bottom of the pack. Disclaimer: Robin and Tim bought "MSR's Pocket Rocket" for backcountry and camping use and decided to review it here on Appalachia & Beyond. The opinions expressed above are their independent thoughts and experiences.